The game looks beautiful, but the brief E3 demo doesn't show anything new to people who gave up on the original shortly after launch. The problem with E3 demos is what the publisher's prepared to show often doesn't line up with what you want them to show. Never have I felt that conflict more than with The Division 2. I've spent about 30 minutes cumulative hands-on time with The Division 2 so far, but that's entailed running the same 10-minute mission three times. 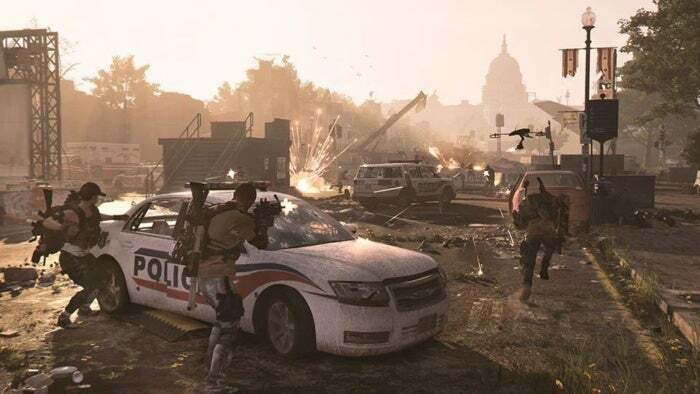 And it's the same mission Ubisoft showed off during its press conference—not a story mission, nothing that really deals with the world of The Division 2. 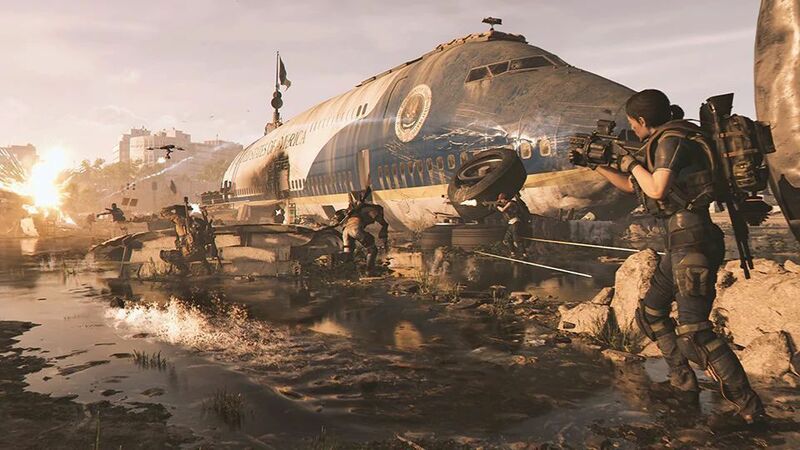 It's a generic end-game mission where you and your three fellow Division agents take over the plot of land around Air Force One, which apparently crash-landed in the swamp near the Capitol. Why? I have no idea. It's literally just a wrecked plane and some swampland in Washington D.C., but apparently it's vital we take it back. So I'm just not sure what there is to say about The Division 2. It looks beautiful—that I can say for sure. We were playing on fully tricked-out PCs, running 4K at a steady 60 frames per second, and it was incredible. You can see direct gameplay capture footage from one of our sessions in the video running above, albeit at 1080p. As always, Ubisoft's art bullpen has knocked it out of the park and into the next county somewhere. They've done a great job capturing, for instance, the harsh brutalism of the Hayden W. Mills building in the beginning of the demo, or the soaring dome of the Capitol and how it shimmers under that East Coast sun. The scale of the world is as awe-inspiring as it was in The Division's Manhattan. I also love the small details too, the crosses that dot every spot of open grass in D.C.'s small city parks, the leftover barricades and looted boxes of supplies that tell a quiet story about a city under quarantine. But aside from admiring the scenery, there's just not much to say yet. Character progression has been reworked, so at some point you'll specialize into an "Archetype," like the Sharpshooter or Demolitionist. These Archetypes come with class-specific skills—for instance, the Sharpshooter can throw out a drone that automatically targets enemies and flushes them out of cover, while the Demolitionist has a proximity mine of sorts. Enemies feel a bit less bullet-spongey too, which is good news. It's a bit dependent on what guns you're using though, with sniper rifles and shotguns feeling deadly efficient and assault rifles still a bit piddly. The moment-to-moment is essentially the same as The Division though. Creep forward, take cover, pot-shot some enemies, throw a few grenades, clear an area, move on. And that's fine, except Ubisoft's demo doesn't really give me anything more. Given the rough reception The Division had, you'd expect Ubisoft to want to demonstrate how its storytelling has advanced in the last three years, or to show off how the Dark Zone (or an equivalent) will work in Washington D.C., or even give us a quick taste of the raids that are apparently coming to the sequel. Those are all new. Those are interesting as someone who didn't love The Division at release but thought it got much better over time—better enough to land on a list of redeemed games we put out earlier this year. 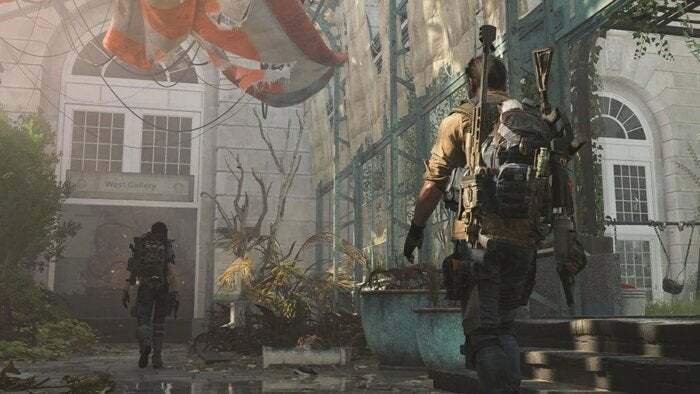 What I wanted was for Ubisoft to demonstrate The Division 2 learned from its predecessor's mistakes, that there's a clear vision this time, that this isn't a Destiny 2-style sequel where it feels like they've started over from square one. And I just didn't get that from a single, out-of-context and combat-centric mission. All I know is it looks great, and the shooting is marginally better. So I guess we wait. There'll undoubtedly be more hands-on demos of The Division 2 prior to its release next February, and I hope we come out of those with a better idea of what's in store. I'd like The Division 2 to make good on the promise of its world, but I'm not convinced it will yet. The first game sure got better over its lifetime though.